Sweet Potatoes: Chips, Strips or Fries. The Final Chapter. Fries. I’ve experimented with sweet potato fries before, but they usually turn out soggy with no crunch whatsoever. Or just burnt. Where is the middle ground? I combined all of the methods to create crispy fries into one post. The outside has a nice bite, while the inside is still soft and tasty. In my opinion, it’s the perfect balance. If you want them crunchy throughout, well, I’m not quite sure that’s possible without actually frying. BUT, the thinner you slice them, the crunchier they’ll get. Just cut down on the cooking time. These are delicious. And again, easy to double, triple, etc. Preheat the oven to 425 degrees. Put your boiler pan (insert for a deep pan that has holes in it) or an oven safe wire rack over a cooking sheet and place into the oven. Meanwhile, cut the sweet potato lengthwise into 3 sections. Then slice into about 1/4” to ½” inch matchstick pieces. Chances are they won’t be perfect, but try to get them all into the same shape as best you can for even cooking time. 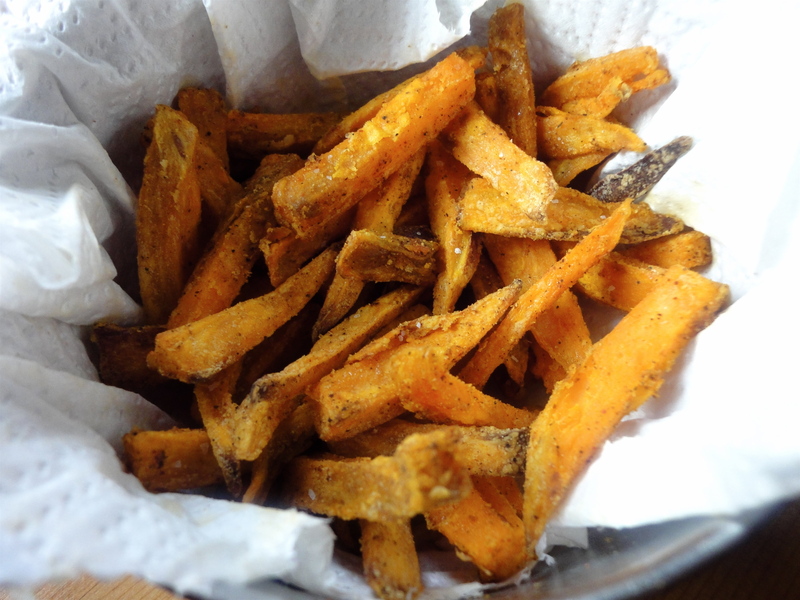 Fill a mixing bowl with 2 cups of ice, the sweet potato slices and enough cold water to cover the fries. This will help pull some of the starch out. Soak for about 30 minutes. After soaking, pat dry with a paper towel to get off all the extra moisture. In a large ziploc bag, put in your fries, cornstarch, pepper and chili powder. Seal it well and shake it until the pieces are well coated. Pop in the 1 tablespoon of oil, and shake it around again. Take your preheated pan out of the oven and spread out the fries on top without overlapping. Bake for about 30 minutes or so, flipping about every 10 minutes. Cooking times my vary depending on your oven, so just keep cooking them until they reach your desired doneness. When finished, allow to cool on a paper towel lined plate. Sprinkle with salt and serve!